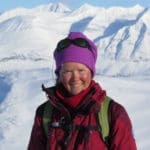 Rosemary Rayfuse gave herself a ski expedition in Sarek National Park as a birthday gift for herself – and she would not regret it. 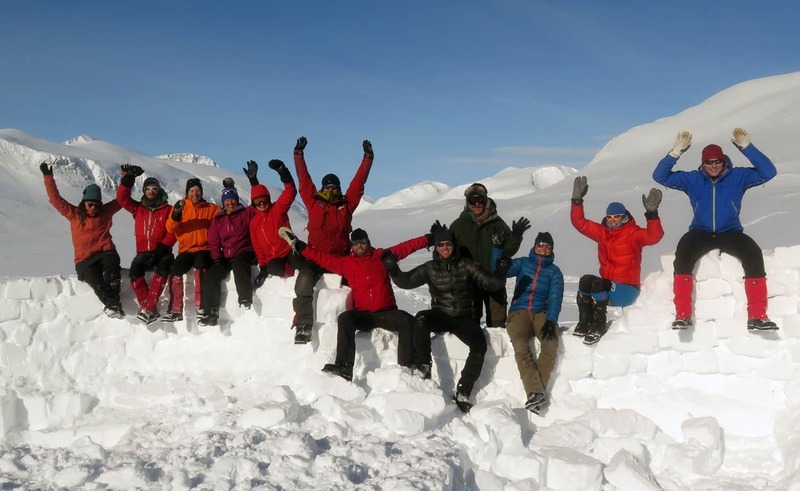 This is her story from the Sarek Ski Expedition.  – If you want to see the northern lights get out of your tents NOW! Christian’s basso profundo boomed out across the camp. I had just gone into my tent, thinking the evening’s display was over. Several of us had been out marvelling at the simultaneous sight of the sunset, a backlit crescent moon, and shimmering green northern lights. How could it get better? I leapt out the door in time to see a dazzling curtain of red and white flash across the sky. The sun had finally disappeared below the horizon and the deepening darkness accentuated the brilliance. Lights danced across the sky, shooting up from the mountain tops, looking for all the world like spotlights from the centre of the earth. Mother nature’s very own – and very extraordinary – light show. It could not have cleared at a better time. We were deep in the heart of Sarek National Park; high on a plateau surrounded by its majestic snow-clad, glacier-laden mountains. The wind had finally dropped and we were in for a clear and crisp couple days to end the trip on. We deserved it. We had been skiing through some of the most beautiful landscape on earth but, thanks to the weather, had seen precious little of it in the five preceding days. Sarek National Park, with its wild mountains of Swedish Lapland, is a part of the World Heritage site Laponia. 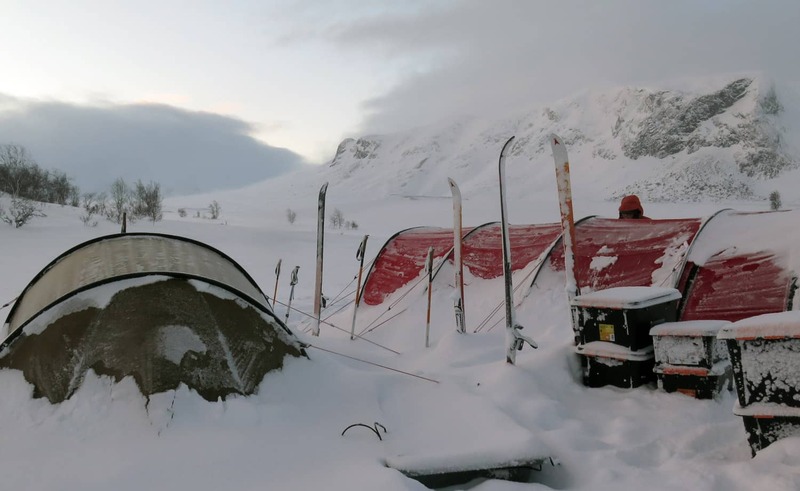 Located above the Arctic Circle, with no roads, no trails, no huts, no motorized access of any kind permitted (except rescue helicopters), and the closest access points at least one day away, it is the crown jewel of Swedish ski-touring destinations. Two well-known long-distance trails, the Kungsleden and the Padjelantaleden pass its flanks to the east and west respectively. 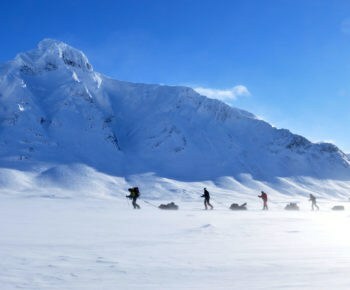 But the only way into and through Sarek is on foot or skis – carrying or pulling all your gear with you. It is a logistical, physical and mental challenge. I’d been thinking of doing Sarek for years but it isn’t really a solo option and I couldn’t find anyone willing to do it with me. So, putting aside my dislike of commercial expeditions, I decided to give myself a birthday present and sign up for a trip. And I’m glad I did. Quite apart from the satisfaction of having finally skied through Sarek, it was simply the best commercial trip I have ever been on. 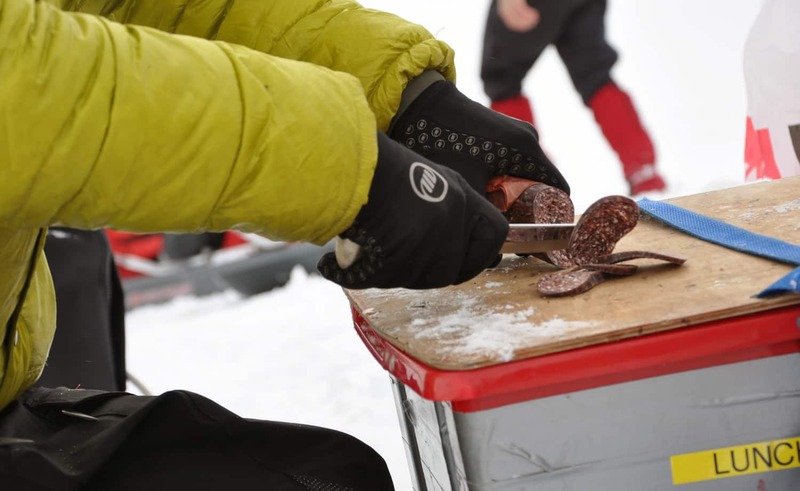 The logistical arrangements and camp processes were brilliant, the equipment was first rate, the food – freshly cooked every day using local ingredients and delicacies like Sami bread, reindeer, moose, Jokkmokk sausage, blueberry soup, lingonberries and chocolate mousse (no freeze dried stuff here!) – was superb, the ten other paying punters (from Sweden, Netherlands, Austria and Germany) were a great group of people, and Mirja, Christian and their ‘trainee guide’ Sara were – apart from supremely capable, professional and knowledgeable – quite simply, a hell of a lot of fun. 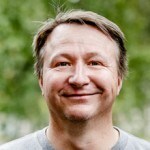 Delicacies like Sami bread, reindeer, moose and Jokkmokk sausage. The expedition started in Jokkmokk, where we gathered at the storehouse to pack food and gear – including the dreaded ‘pulkas’ (sledges). The next morning the gear was loaded into a truck while the eleven of us punters piled into a minivan and car for the 3.5-hour drive northeast to Ritsem – Sweden’s longest blind alley. The weather forecast was not good – gale force winds from the west and snow. The closer we got the worse the conditions became. Driving through the raging blizzard, it was all we could do to find the road. But eventually, we arrived at Ritsem and went into STF’s hut to have lunch. The plan was for us to be transported about 15 km across lake Akkajaure by snowmobile and then to ski the remaining 16 km to some reindeer herders’ cottages at Kutjaure carrying just a day pack while all our gear was transferred there by snowmobile. Some of us had thought this a cop out – but with the blizzard raging outside we were beginning to come around. In addition, the lake is part of a massive hydro scheme and when water is released the ice heaves leaving huge cracks, pressure ridges and other obstacles. 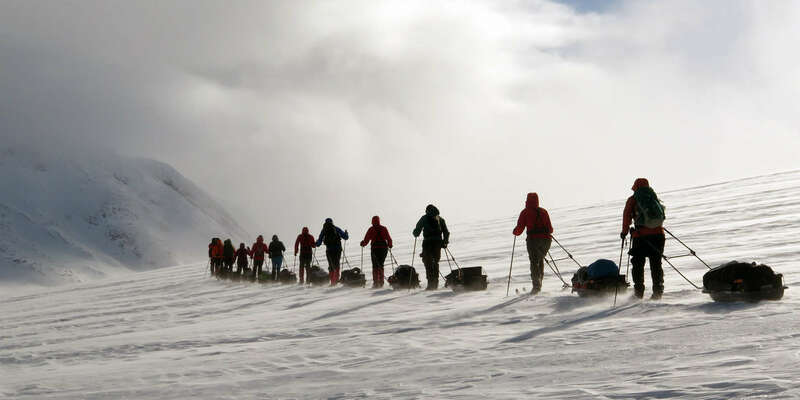 As we whizzed across the lake, buried deep in every piece of clothing we had with us, flashbacks of the agonies of hauling sledges over pressure ridges at the North Pole returned. When we passed some miserable looking skiers en route I was glad to be where I was. As we eventually strapped on our skis and headed into the blizzard I was equally glad to be testing my ski legs with no pulka attached. The fresh snow was knee deep and heavy and we were going into a gale force headwind. After about 12 km we were more than relieved to see the snowmobiles come to pick us up to take us the rest of the way. Our last chance at assistance before we skied into and out of Sarek. It is a logistical, physical and mental challenge. Average daily distance skied: 15 km. Coldest overnight temperature: about –27°C. Skis used: full metal edge waxless Nordic mountain touring skis (Åsnes Fjellski (Amundsen, Arneson, Cecilie), Fischer E99) with three pin/NNN/Riva bindings and leather boots and kicker skins; Norwegian fjellpulkan (mountain sledges) with full pack bag, Hilleberg tents. The next day we ‘saddled’ up and headed east, this time with the wind, still gale force, at our backs. It was still snowing and almost total white-out. We skied across the lake staring intently at the pulka in front of us so as not to lose our way. After a couple of hours, we entered a river valley and started a slow, low angle ascent. Hans, whose cold had only worsened, could take no more. The decision was made that Christian would take him back to Kutjaure, find some way to arrange for him to get out, and then rejoin us later that evening. 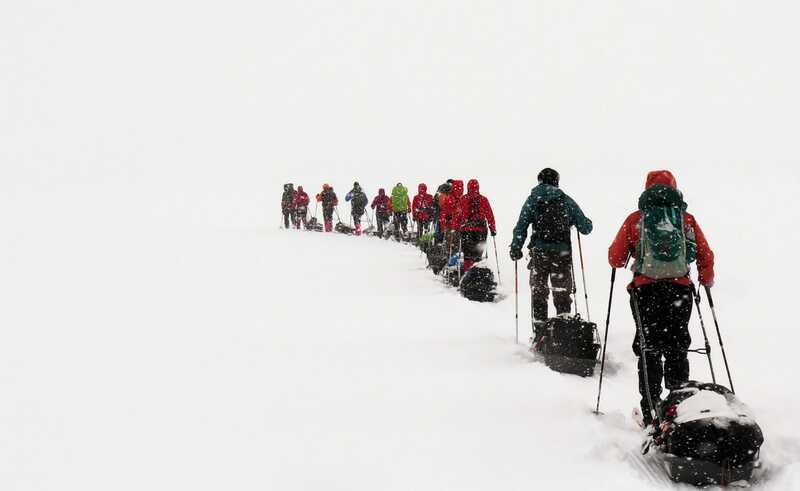 More than one of us wondered if we should join him – but in the end, we all continued, ploughing through the thigh deep snow. 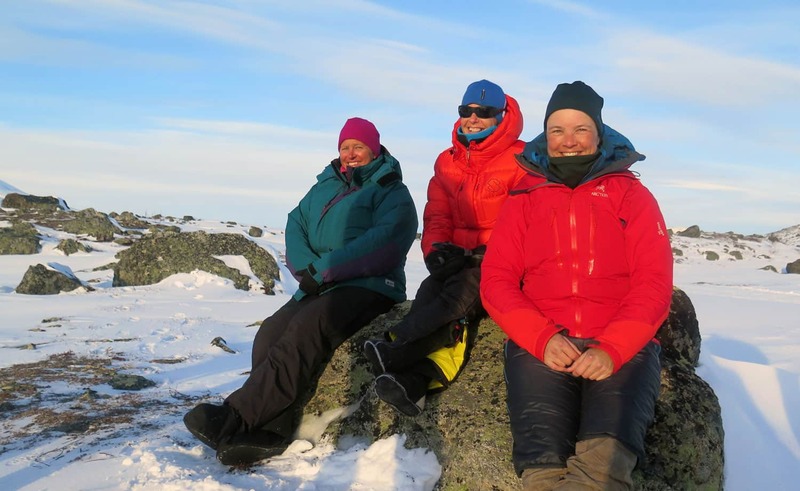 We stopped for lunch at the boundary of Sarek National Park and here we all had a bit of a surprise when Mirja told us to put up the ‘mess’ tent. Several minutes and a lot of snow shovelling later we were all tucked up inside, blissfully out of the wind and snow enjoying a relatively warm lunch. Taking the tent down to move on was one of the hardest things any of us had done in a long time. Several hours and 12 km later we made camp for the night in a bend of the river – not as far along as originally planned but we had to let Christian catch up with us. Any doubts about how much the huge snow cornice behind us was protecting us from the wind were immediately dispelled when bodily functions necessitated post-holing across the river to the trees on the other side. We woke up in the morning to even deeper snow and the ever-present wind. But at least the clouds were now parting giving us occasional glimpses of the huge bulk of the 2000 m Ahkká and making the 400 m climb up to the top of the watershed leading us into the Ruohtesvágge a little easier to bear. As deep snow turned to wind-blown sastrugi and then to solid ice, I was glad I had put on my kicker skins. It is hard enough dragging a pulka on an uphill traverse in good conditions. These were not good conditions. But by lunch, we were on top and the rest, as they say, is history. The next day we continued our way, now well into our routine of breaking camp and trudging on, one after the other. To say this was skiing is perhaps to put too fine a turn on things. This was walking on skis. The plans to bag a few small peaks en route sans pulkas had been shelved due to weather and conditions. Possibly just as well. That afternoon we had our first experience of a steep downhill traverse over black ice with pulkas. It didn’t go well for some. But it did get us into yet another well-protected camp spot. Mirja and Christian clearly know the area like the back of their hands. Even more snow in the morning. The next day was a short one. Originally intended as a rest day available for skiing at will, part of it had been lost when we stopped early on night one to allow Christian to catch up with us after taking Hans back to Kutjaure. 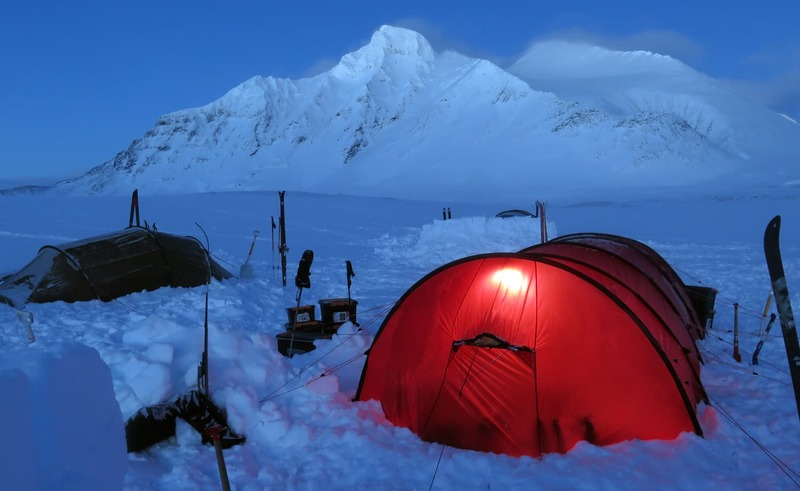 By lunch, we were where we wanted to be for the night – right in the heart of Sarek up on that high plateau Bielavallda. It was an exposed spot so after lunch we busied ourselves building wind walls ostensibly to protect the tents but just a way of keeping busy. By 16.30 the wind was dropping and the clouds were lifting enough that a group of us could ski over to the edge of the plateau and look down into Rapadalen, another of the great river valleys running through Sarek. Far down below we could see the land of the Sarek moose, bounded on both sides by the steep cliff faces of Skårki, Ålkatj, Bielloriehppe. 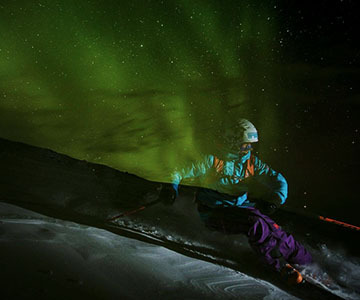 We skied down to explore, revelling in the freedom of skiing without a pulka. But eventually, dinner beckoned so we headed back admiring, for the first time, the now visible peaks all around us, including the mighty Ähpar. And then nature put on her show. 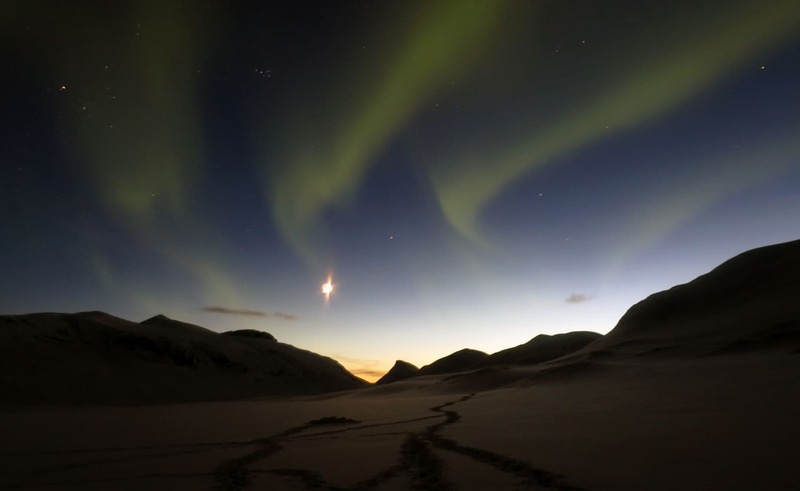 Sarek National Park was founded in 1909 to protect its high-alpine environment. Here you’ll find six of them in total twelve peaks that reach over 2000 m, in Sweden. The Rapa River, the artery of Sarek supplies the lush Rapa delta with water from melting snow and the over 100 glaciers. The Sami people have migrated their reindeer through the impressive U-shaped valleys for hundreds of years and they still do. This unique combination of cultural landscape and apparently untouched nature is protected as part of Laponia World Heritage site. 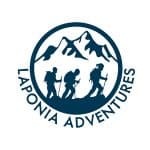 Learn more about the yearly Sarek ski expedition at laponiaadventures.com. The next day dawned clear and bright and still. We spent some time practicing with our avalanche transceivers and then some of the group headed off to bag a small peak en route to the night’s camp spot somewhere about 16 km away, while the rest took a more leisurely approach to life, checking out animal tracks, admiring the lines made by a group of snowboarders/alpine tourers who were making the most of the break in the weather, and enjoying a long, and finally sunny, lunch. We were leaving the big mountains behind and we wanted to admire them as long as we possibly could. Another great dinner and exciting display of northern lights later, we were off on the last day of the trip, a 16 km gradual downhill slide past the volcanic-looking pyramid of Sluggá to the boundary of Sarek and beyond to Lake Pietsaure where the snowmobiles were waiting to transfer us the final 15 km to Saltoluokta Mountain station, showers and a celebratory dinner complete with a now recovered Hans who had his own stories to tell about how he managed to get there to meet us. Of course, we could have skied this as well but it would have added another day to the trip and, after the excitement of the mountains would have been monumentally boring… On Sunday morning, we were transferred by snowmobile across yet another lake to the road head at Kebnats where the van was waiting to drive us all back to Luleå airport, about 5 hours away. 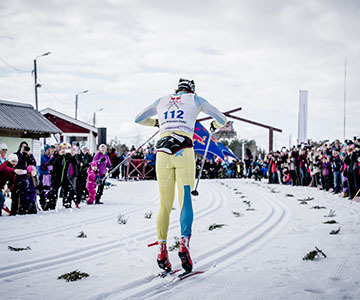 The world's longest cross-country ski race, 220 km, take place in Jokkmokk. How did it all begin, and why?